After getting a haircut in London and a few new outfits (“she bought two pairs of shoes and began to enjoy herself”), Millie, the neglected American wife of an academic pill, is transformed—and, upon arrival in Africa, falls into the perfect affair. 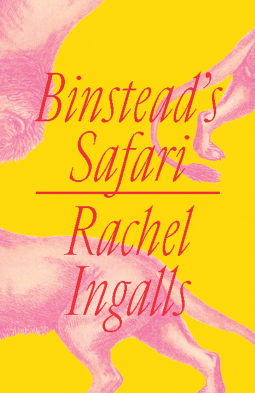 Binstead’s Safari unfolds the fractured fairy tale of the rebirth of a drab, insecure woman as a fiercely alive, fearless beauty. “Life was too short to waste time trying to find excuses for not doing the things you really wanted to do,” Millie realizes, helping herself to love and joy. The husband is astonished—everyone adores the new Millie. She can’t put a foot wrong, and as they move deeper into Africa in search of lion myths for his book, “excitement and pleasure carried her upwards as on a tide.” Mysteries abound, but in the hands of Rachel Ingalls, the ultimate master of the curveball, Millie’s resurrection seems perfectly natural: caterpillar to butterfly. “Only now had she found her life”—and also her destiny, which may, this being Ingalls, take the form of a Lion God.